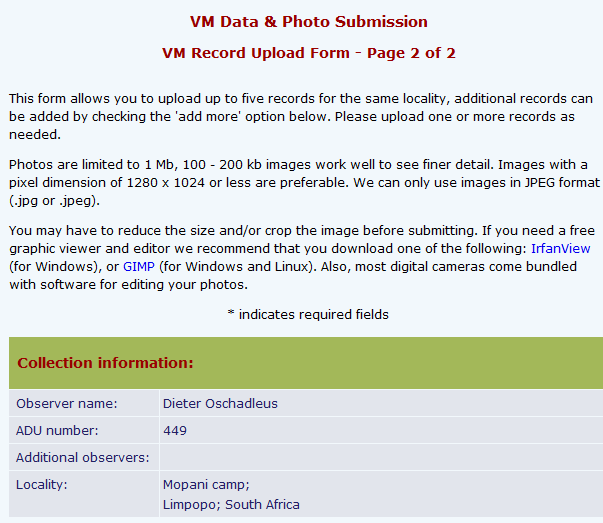 Below help is given about how to submit your record - there are screen shots to show what the VM pages look like. Login on the Virtual Museum site - see menu on left (use your email and password to login). Click on 'Data upload' in the menu. There are 2 form pages to fill in. 1. Observer information - your name will be selected based on your login. You may add additional observers in the text field if you like. 2. Collection date: The date is the day of taking the photos and recording colony details. 3. 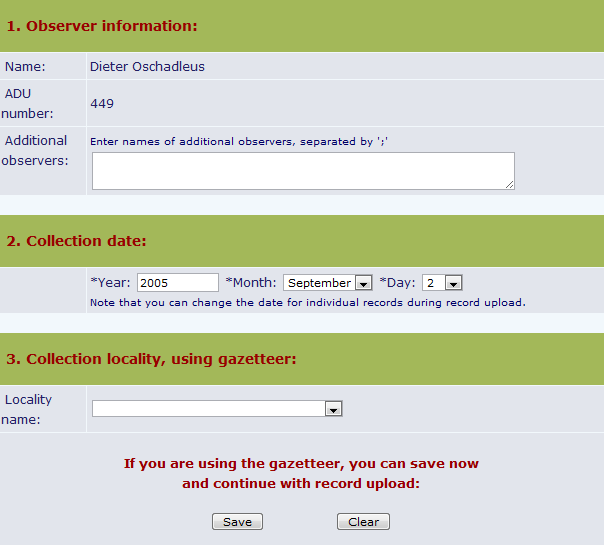 Collection locality, using gazetteer: If you are recording a new colony/site, skip this step. If you are photographing a colony you have submitted previously (and saved the colony locality to the gazetteer), you can choose this colony site and and hit "Save". See more here about Repeat counts. You can now skip Step 4 of the web form. 4. Collection locality: Choose the "Country". If it is not listed, type the country in the text box. If in South Africa, choose a "Province" - this step is optional, especially if the colony is outside South Africa. "Closest town" - or actual town if the colony is in a city or town. "Locality" - describe the colony locality. "Altitude" is optional. 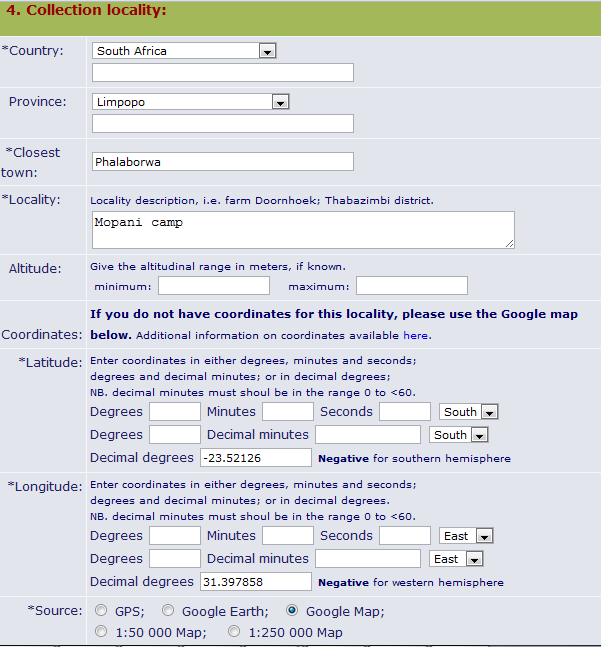 For longitude you must choose the corresponding option. "Source" - choose the appropriate option. "Accuracy" - optional. "Gazetteer locality name:" If you expect to take photos at the same colony again, then choose a locality name and hit Save; this name can be the same as you used in Locality; the name you choose will be linked to your observer name (only you can see it in your gazetteer list). See more here about the Gazetteer. Option (4) = 5. 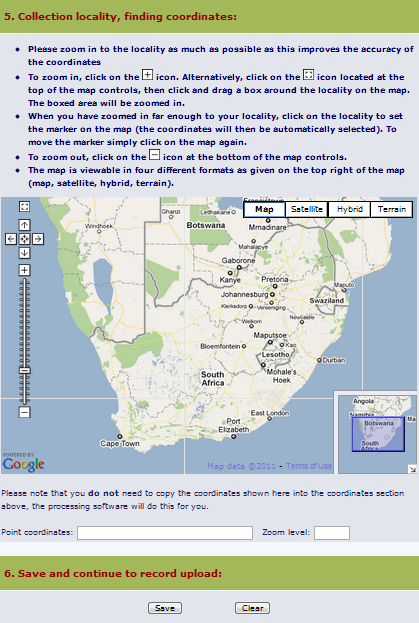 Collection locality, finding coordinates - follow the instructions to find the locality on the google map. Hit "Save" and Page 2 will open. Prepare your photos on your computer - follow the instructions on the top of the page. If you need a free graphic viewer and editor we recommend that you download one of the following: IrfanView (for Windows), or GIMP (for Windows and Linux). Collection date - this will be filled in from Page 1. Photos - you need to upload at least 1 photo else nothing of the record will be saved. Maximum 3 photos per colony on one day. Click on the "Choose file" button and navigate on your computer to where the photo(s) are. Sound bite - skip this. Notes: add any interesting additional notes, eg identity of nest site, number of old and new nests, activity of males and females, number of males and females, predation, etc. The most useful item to note is the colony is active (evidence of eggs or chicks in the nests). Colonies can be submitted even ehrn they are not active, but this must be noted in the Notes. Nest count: put the number of nests actually counted, including old and new nests; exclude broken or incomplete nests. If you suspect that there are more nests not visible (eg in a reedbed), you can estimate how many nests there could be in the Notes field. 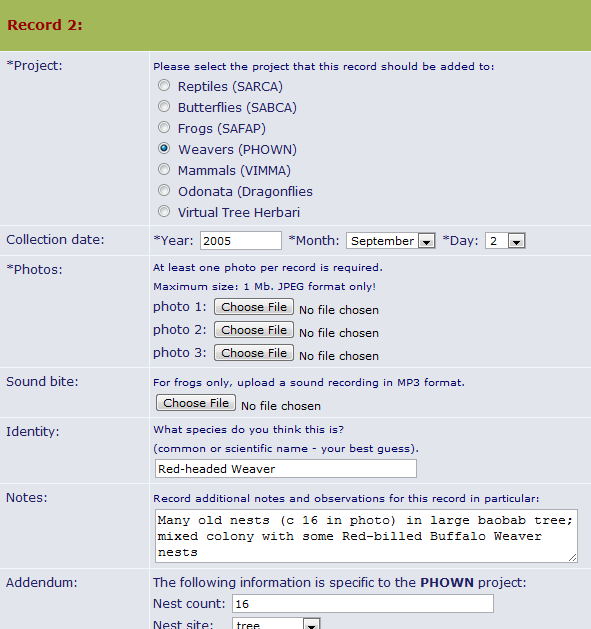 Record 2: - use this option only if you have records of the same colony on a different date. 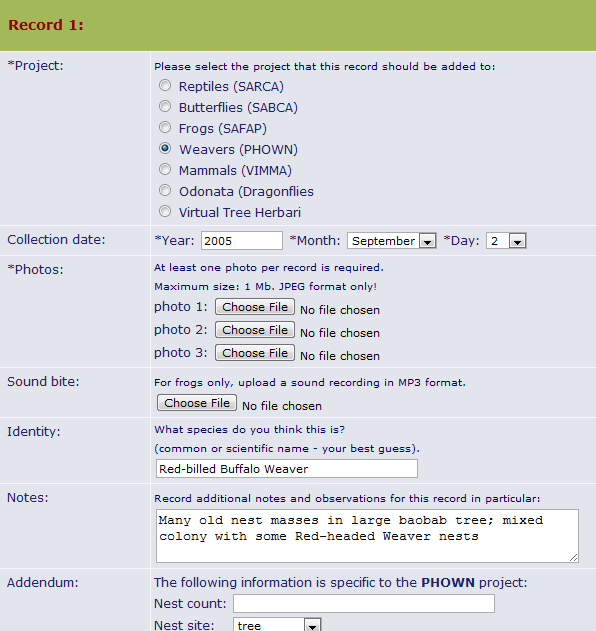 You can also use this option for mixed species colonies where Record 1 would be for one species and Record 2 would count the nests and show photos for the second species. If there is one date record for a colony, then skip Record 2 and 3, and go to "6. Save and continue to record upload:" and hit Submit. For different/new colonies, start with a new Data Upload form. If you see one or more photo summaries similar to these, the records have been successfully uploaded. Usually after a day or two you will be able to see your record accepted. WE LOOK FORWARD TO YOUR PARTICIPATION IN PHOWN !